Basic Rotation Rules | by Marianne Burkett – WELCOME TO OUR INTERNATIONAL SUPPORT! Of all the calls that come my way on a weekly basis, one of the top 5 is “Rotations” and how to improve them. Rotations are a sensitive subject. Program Directors worry about them constantly. Even the slightest changes in your library or clocks can throw your rotations off… so you need to install the correct rules to stop that from happening. Day Offset Window. This rule will protect from Hour Marker to Hour Marker within the hour from day to day. For instance, if a song played in the noon hour today, it would not be able to play in the noon hour tomorrow. It does not protect the song from scheduling at 11:59, nor does it protect the song from playing at 1 minute past one. It would only protect within the hour. 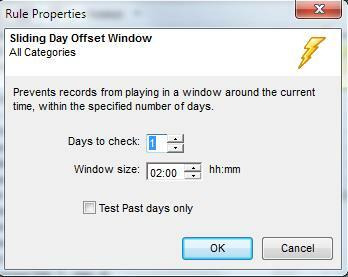 In the example below, I have the Day Offset Window set to protect 1day and 1 hour. 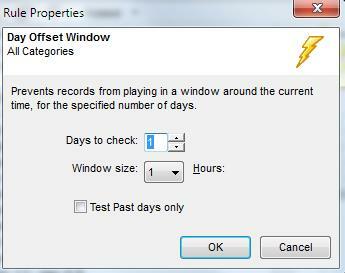 To improve the performance of a category, you can tinker with the rule and change the “Days to check” or the “Window Size”. Typically when I set up rules, I’ll push the envelope at first and relax it until the Auto Scheduler is successful in scheduling the songs, and/or when I’m happy with the way the rotations look. We also have another “Day Offset” Rule that is more exact and flexible. The Sliding Day Offset Window. Sliding Day Offset Window. Much like the Day Offset Window, but a little more versatile as it protects the “window” around the actual time the song played. For instance in the rule illustrated below, if a song played yesterday at 1:15pm, the rule 1 day, 2 hours, would protect the next day 1 full hour either side of 1:15. The song would be unable to play one hour before and one hour after the time it played yesterday, or between 12:15 and 2:15 the next day. It tests forward since the”Test Past days only” box is not checked. Now, let’s look at the Play Offset Windows! 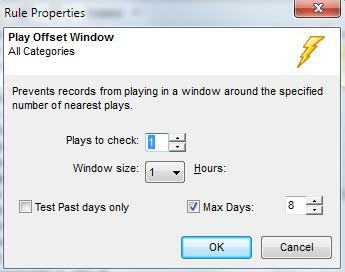 Play Offset Window: Protects around the last time the song played and doesn’t take into account how many days back it played unless you add the “Max Days” cutoff which directs the rule to stop and restart. This rule also only protects Hour Marker to Hour Marker (Top of the hour). 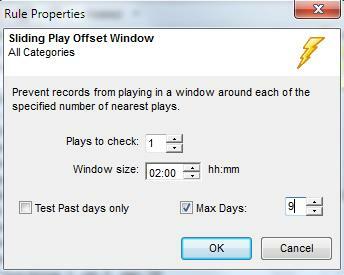 Sliding Play Offset Window: Protects around the actual time the song played within the hour, so like the Sliding Day Offset Window – this rule ignores the hour markers and just looks at the actual time of the play. Important to note: If you choose to NOT engage Max Days in your “Play Offset” rules, your scheduler will look back in history for an undetermined amount of time …searching for the last play of the song. I like to use the example of Stevie Nicks/Silent night. The last time it played was at 11am on Christmas day…and here it is the day after Thanksgiving next year… and you’re just rolling out your Christmas music for the season. Stevie Nicks, Silent night would be restricted from playing in the 11am hour that day because of an un-checked Max Day setting. So, make sure you put some kind of Max Days in there. It’s a subjective setting. I usually look at category turnover times 3… and put that number in. When should you use Day Offsets as opposed to Play Offsets? We recommend Day Offsets for small categories that come back multiple times a day or even the next day or two. Play Offsets are used for larger, slower rotating categories that may come up a few times a week or month or…even year! Like all things in music scheduling, everyone has opinions and varying degrees of knowledge of exactly how they’d like their library to schedule. In a perfect world, every song would schedule every hour in the day before it came back to the same hour…right? That certainly would be nice, but given the fact that you have multiple artists with many songs, artists with one song, small categories, large categories, dayparted songs, slow songs… I could go on forever with the reasons …but what you really would like to happen, probably won’t happen because of all the variables. Using these hour rotation rules can help you achieve an overall balance. In my opinion, Music Scheduling is an art form and each programmer is unique. The differences in programming styles should be applauded, for how boring would radio be – if we were all alike!